Ferns are a widely varied group of plants. Their native habitats range from the tropics to the Arctic and from deserts to swamps. They may be coarse or delicate, succulent or filmy, crown forming or creeping, lime lovers or lime intolerant, invasive weeds or virtually impossible to cultivate. One of the first plant groups to adapt to life on land, ferns have since adapted to most conditions and environments, but relatively few are able to contend with direct sunlight and low humidity. Most species need moist soil, high humidity and enough shade to maintain these conditions. Ferns are essentially wildlings; unlike many of the flowering plants, such as herbaceous perennials, they have not been hybridized for garden conditions. Before you begin your fern garden, observe the ferns growing naturally in your area. Most of these are available commercially. Be sure to place them in your garden where conditions are comparable to those supporting the native ferns in the wild. Be cautious in your selection. If a fern's growth in the wild is rampant, it is likely to be even more so in your garden. If the fern grows only in a specialized habitat, such as moist rock crevices, it may be difficult to grow in the garden. Grow only those plants for which you have the proper conditions. Never collect ferns from the wild. When you buy ferns, look for reputable dealers who state explicitly that their plants are nursery propagated, not collected from the wild. Selected forms with fancy fronds are always nursery propagated. The section of the country where you live and garden determines to a large extent the plants you can grow. Most of Florida and the southern coastal areas can grow the tropical ferns that the rest of us can cultivate only under glass or as house plants. Southwest gardeners can grow only those that have adapted to less humidity, while gardeners in the midwest, northeast, mid-atlantic and upper south can grow most woodland types. Keep in mind, too, that some ferns have specialized requirements. It's not impossible to grow maidenhairs, hart's tongues or other ferns that prefer an alkaline soil, even if your soil tends toward the acidic; mixing crushed limestone, oyster shell grit or cement rubble in the soil will provide a constant source of lime and improve drainage. If you live in a limestone area and want to grow those that require acid conditions, it is not quite so easy. You can make the planting bed acidic by working lots of peat or humus into the soil, separating it from the subsoil with landscape fabric or a two-inch layer of granite grit and treating the soil with sulfur or ammonium nitrate. The problem is that the water in these areas is likely to be alkaline, and will gradually change the pH of the soil. Under these conditions, it's best to grow ferns that prefer limestone, or those tolerant of alkaline conditions. Most adiantums, aspleniums, polystichums, dryopteris and athyriums will grow in a wide pH range, and the organic material in a well prepared soil will help to buffer the effect of excess acidity or alkalinity. Many ferns have a natural affinity for rocks. Some, such as polypodies and the walking fern will actually grow on the rock surface; others, such as Cheilanthes and the cliff brakes, need exceptionally sharp drainage and more sun. Almost all appreciate the protection of rocks, which help the soil retain moisture and establish a microclimate that is warmer in winter and cooler in summer than the surrounding environment. It's important to know which ferns must have limestone and which require acid conditions. Sandstone and granite rocks are generally the foundation for those needing acid, while limestone or even cement rubble will provide alkalinity. Ferns among rocks should be planted in a well drained but moisture-retentive soil. For gardeners in most regions of the country, species adapted to woodland environments are attractive and easy to grow. In most areas, Christmas or sword ferns (Polystichum spp. ), lady ferns (Athyrium spp.) and shield ferns (Dryopteris spp.) are commonly found in the wild. These genera contain other non-native species that will grow under similar conditions in the garden. Most prefer a slightly acidic soil with 50 to 75 percent humus, good water retention and excellent drainage.To add humus to your soil, work about 4 inches of coarse compost, rotted manure or fine pine bark into the top 4 to 6 inches. All ferns require ample moisture for growth, as well as a certain amount of humidity to prevent dehydration of their foliage. Established plants of most woodland species are tolerant of periodic dry spells, but that doesn't mean they will survive bone-dry conditions. Only a very few are adapted to life in bogs or really wet conditions. Swamp, bog and streamside ferns such as the osmundas require more water than most woodland ferns. Woodland ferns do best in high or dappled shade. The open shade of mature trees or the north side of the house or a wall, open to the sky, provide nearly ideal light conditions. Most woodland ferns will adapt to relatively low light levels, but no ferns thrive in deep shade. Evergreen species are the most tolerant of low light levels. Generally, plants will tolerate more sun and less water in the northern part of their range. The stronger the sun, the greater the need for water; conversely, the more water available, the more sun they will take. The nutritional needs of ferns are generally met with compost or the breakdown of leaves. Small size and slow growth are more likely to be caused by limited water than lack of food. In fact, ferns are sensitive to excess fertilizer; quick-release inorganic fertilizers are likely to burn the roots. If supplemental feeding is needed, use well rotted manure, fish emulsion or other slow-release organic food. Wind protection prevents the breakage of brittle fronds and reduces dehydration. While shelter is an advantage, the lowest, most sheltered spot is also probably a frost pocket which can delay spring growth, and result in early and late frost damage to deciduous ferns and winter-kill of species with borderline hardiness. The best time to plant varies according to geographic location. Spring planting is preferable where winters are cold and wet. If ferns are planted late in the season in these areas, the roots could very well rot before they are established. Alternate freezing and thawing may heave the rhizomes from the soil, breaking young roots and exposing them, making them prone to desiccation. In warmer climates, fall planting is preferable because the plant has time to establish itself before the stresses of summer heat and drought. If you move or plant a fern that is actively growing, cut the fronds back by half to reduce stress from water loss and help it get established. New fronds usually will be produced as soon as the plant has enough roots to support them. To move a fern, dig a generous root ball, especially if the plant is in active growth. Next, dig a hole the same depth as the root ball and place the plant in the hole, water well, fill in the sides with good soil and firm the soil around the plant. If the job is well done, the fern may never know it has been moved. Many ferns available for sale are grown in quart size or larger pots. These are either mature size or will grow to maturity in a year or two.To plant a potted fern, knock the plant out of the pot and gently shake or tease the roots apart. It is important to remove excess potting soil, especially if it differs significantly from the soil in your garden. Potting soils are often light and peaty and will dry out faster than the surrounding soil. This may leave the newly planted fern dry and wilted even though the surrounding soil is moist. To rectify the situation, spread out the roots, mix some of the potting soil into the root area, water well and fill in the planting hole with good soil. Keep newly planted ferns well watered for the first growing season while they are becoming established. Never let plants growing in 4-inch or smaller pots dry out until they reach a mature size and are well established. Plant them in well prepared soil in a protected area. It is often easier to pot them up for special care. Add fine pine bark to any good potting mix to improve drainage. Do not feed until they are growing well. If the fern requires alkaline conditions, you can add a tablespoon of ground limestone to a gallon of planting mix. Ferns sold by mail may have been removed from their pots and put in plastic bags or they may be almost bare rooted. When you unpack the plants make sure that the growing tip has not been damaged during shipping. If it has been broken or has rotted, the fern will probably not recover and the shipper should be notified immediately. Depending on size, either pot the fern or plant it in a protected spot and keep it well watered until it has had a chance to establish itself. If the roots seem at all dry, set the plant in water for one to two hours while you are preparing the planting area. Some ferns may be purchased as small bare rooted plants packed in dry peat moss in a plastic bag. In theory, there is enough humidity in the bag to prevent desiccation of the plant; in practice, ferns do not appreciate being bare rooted, and while they will certainly rot if they are enclosed with wet peat, they are generally dry enough to need a recovery period. Unless you can actually see signs of active growth such as a crozier beginning to uncurl, bare rooted plants are best avoided. Often the growing tip has been damaged by handling, or the peat has become completely dry. If you do try ferns sold this way, soak them in water for a couple of hours and pot them using a good, well draining potting mix. Be careful to keep the growing tips at or above soil level. Keep well watered and transplant to the garden after they have become established. Another disadvantage of ferns sold bare root is that they are frequently dug up from the wild. How far apart should you plant your ferns? Spacing depends on form, size and type of growth. Crown formers with upright rhizomes and vase-shaped form spread slowly and show to best advantage as a single crown. Goldie's fern and some of the larger growing polystichums and osmundas may need three feet or more between plants. Oak and beech ferns spread quickly and can be planted fairly far apart. 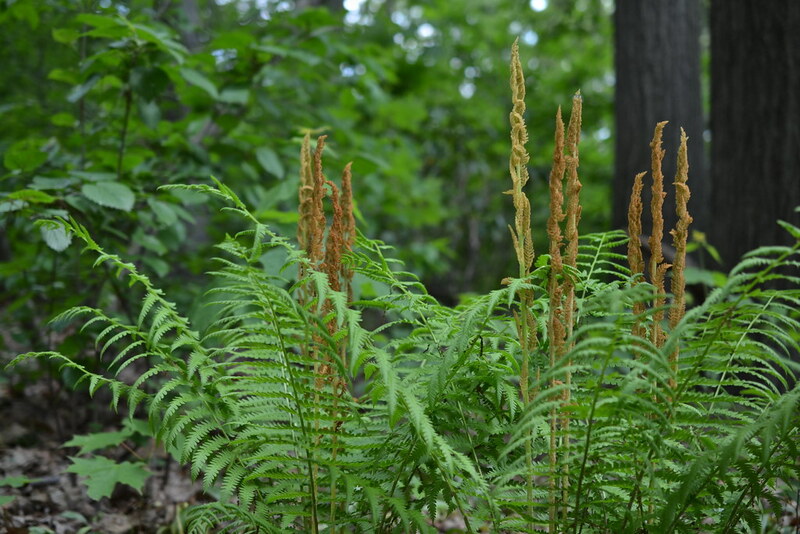 Hay-scented, New York and Virginia chain fern are even more rampant spreaders, and the ostrich fern, which spreads by far-ranging runners, is best planted in an area where it can be controlled. Both fern fronds and roots grow directly from the stem, which is also known as the rhizome. All new growth is produced at the stem tip, and if it is damaged the entire plant may be killed. The roots grow at the base of the fronds, or on the lower side of creeping rhizomes. In all ferns they are close to the surface and easily disturbed. Upright-growing rhizomes form a distinct crown consisting of the tightly coiled croziers at the soil surface, which grow in spring into a whorl of fronds that radiate from the center like a vase. These may grow out of the ground to form small trunks. The roots that grow at the base of the fronds are then exposed to the air and can dry out. If crowns lift themselves out of the soil they need to be replanted to return them to soil level. Adding one to two inches of mulch each year may make replanting unnecessary. Rakes, hoes and feet do not belong in the fern garden. Surface roots, tightly coiled croziers and developing fiddleheads are too easily damaged. Leave a place to walk, and remove by hand winter-burned evergreen fronds and any other garden debris before the fiddleheads begin to unfurl in spring. If you choose plants suited to your growing conditions and practice good gardening hygiene, removing debris that may harbor pests, you may seldom have to deal with diseases or pests. Slugs and snails tend to be the most common problems; they are voracious eaters that thrive under the same conditions as ferns. Slug baits containing metaldehyde are effective, but they are toxic and especially hazardous to children and pets. Various nontoxic baits and traps are safer: Dishes of beer sunk to soil level are effective. Slugs will also collect under overturned grapefruit shells and can then be dropped into denatured alcohol for the coup de grace. Ferns are quite sensitive to insecticides. If you must use a chemical poison, test it on a few plants. Avoid the liquid emulsion sprays, as they contain oils that damage ferns. Use dusts or sprays made from wettable powders, reducing the recommended dosage by one half. To prevent disease, start with healthy plants. Keep the crown of the plant above the soil, and don't cover it with mulch. Avoid overwatering and space the plants far enough apart for adequate air circulation. Mulching with fine pine bark, pine needles or a fairly coarse compost will help keep the soil moist, prevent weeds or at least make them easier to pull and provide essentially all the nutrients your ferns need. Replenish the mulch each year to compensate for the tendency of certain athyriums or dryopteris to raise their crowns above soil level. Which Ferns Are for You? Nancy Swell grows and propagates a wide variety of hardy ferns in her garden in Richmond, Virginia. She is an active member of The American Fern Society, The British Pteridological Society and The Hardy Fern Foundation and is a self-proclaimed fern fernatic. What is the growing depth of a hardy fern (Zone 6) and can they be planted around a tree with an upward growing root system like the English maple? Help! My southern wood ferns are much smaller this year (half to two-thirds the size they have been for over 20 years!). I live in Dallas in a heavily treed neighborhood of post oaks. I have never fertilized them but water regularly. One area where the ferns are smaller is now getting more sun after a tree was removed 3 years ago, but in another area where no change in conditions has taken place, the ferns are smaller also. It is midsummer now and I just added peat and hardwood mulch, but to no effect yet. What should I do now and/or in the future to bring these back to their full glory? Thanks! Living in central Louisiana, Zone 9, allows me a wide range of fern options. Have grown many different species successfully and some not so…this article helped me see where I went wrong. Thank you for insuring future healthy plants. Is there a recommended way to thin out a fern bed? We have about a thousand square feet of ferns across several beds that have gotten extremely thick in the past year to the point of unattractiveness. Jane, give them a few weeks to see if they recover—which will be slow if at all. Hot dry air usually doesn’t kill leaves on its own, but lack of shade or watering will. I planted two autumn ferns and the hot dry air has killed the leaves even though I have kept them watered. Will they come back out? We have ostrich ferns (Matteuccia) growing in our back garden. The fronds grow up to 55 inches and look great—when standing. By the end of July, the fronds are toppling over. Any suggestions on how best to support the clumps and keep them standing tall? I thought about tomato plant towers, but wonder if there aren’t supports that are specifically designed for ferns. Thanks for any advice! Hi BBG, I’ve been searching around but can’t find any definitive answer to my query. I bought 4 ferns (Athyrium niponicum var. pictum) from a local shop after they had gone dormant last year, only small 9 cm pots; they were kept moist and under my potting table. I’ve been patiently waiting for new growth so they can be positioned into place around my pond, however, there are zero signs of growth. So should there be new growth by May? If so I will return them. Because new roots will form in the warmer weather, this is a good time to divide and plant your lady ferns. Lady ferns form clumping crowns, rather than extended rhizomes or creeping rhizomes like some other ferns. If you have had these ferns for a long time, you may see evidence of the crown already beginning to split. If not, you can separate the crowns by using two forks back to back and pushing the clump apart. The clump may also be split with a knife. It’s important not to plant the crown pieces too deeply: Plant them perhaps a half an inch deep, or where they were relative to the soil line before division. I have many lady ferns, some 20 years old. The older ones are now coming out of the soil and have brown fernlike shoots springing out of the middle of the “root ball.” It is early spring and I am unsure what to do. I really do not want to lose them. Look closely at the two areas, where the ferns are thriving and where nothing is growing, and see if you can find any differences between them. Dig down into the soil, pay attention to trees growing nearby, look at drainage patterns from nearby sidewalks or slopes, and so on. Use a sharp spade to dig out the ferns with as much root ball and soil as possible. Many ferns grow by rhizomes with shallow roots, so you won’t have to dig deep. In either case, try to keep as much soil as possible with the roots. In the spot where you would like the plants to grow, dig for each a hole the depth and width of the root ball or rhizomes. You want the plant in the new spot to be growing at the same soil level the fern was originally. Be sure to fill in soil around the roots so that it is at the same soil depth as it was before you dug the fern up. If weather conditions are dry, water every few days until plants are established. My established ferns are growing beautifully, so much so, that I decided to up root some and replant them further away in a blank spot. Unfortunately, this has not worked out as I thought it would Can you help? I live in wooded area with many woodland ferns growing along my walking trail in northern Minnesota. Today I noticed hardy ferns growing in the woods. These ferns have soft brown material attached to the stems. If I just deposited the brownish material containing the tiny seedlike material directly to the soil in my yard near the lake, will ferns emerge? In general, larger pots, perhaps gallon size, will allow the ferns to spread their roots and achieve maturity. Your type of fern prefers moist to a bit dry, humus-rich soil and shade. The pots you use should drain any excess water well. This will not only prevent soggy roots but also prevent salt buildup. If a fern outgrows the pot and you prefer not to repot it in a larger container, you may remove the fern from the pot and trim its roots back from the tips; remove about a quarter of its length. Remove any “black” strands at this time, as such roots are dead. Just purchased two Dryopteris erythrosora ferns in 4-inch pots that will be planted in containers. Any recommendations for type of container, size, etc., would be appreciated. Thank you for this thorough and most helpful site. Cutting back the fronds is not likely to kill your plants, but doing so won’t solve your problem. If your ferns are growing too tall, consider moving them to a site where their height is more suitable and select new ferns with less height at maturity. Before you purchase replacement ferns, check the labels for height information. If you have clumps of ferns that are spreading aggressively, the best thing to do is to divide the ferns, either after the first fall frost or in the early spring when new growth is just showing. Different types of ferns require different types of division. Two online references from Clemson University has two helpful online references, one on ferns in particular and one on dividing perennials. My ferns are getting way too big. Can I cut them back or will it kill them? Since you need the ferns by August, you should probably buy them as fairly mature plants from your local nursery. Choose ferns that are compatible with your environment. For more in depth information, the following book includes an encyclopedia section detailing features and cultural requirements for about 50 ferns for the home garden: Ferns: Wild Things Make a Comeback in the Garden, (C. Colston Burrell, editor, Brooklyn Botanic Garden, 1994). Native Ferns, Moss and Grasses, IWilliam Cullina, Houghton Mifflin, 2008) is also a good reference; the book includes a 60-page encyclopedia of ferns and how to grow each one. Love the information !! I’m looking for ferns to grow for my sons wedding in August. Something easy, still learning about all the different kinds. Osmunda cinnamomea (cinnamon fern) in the Native Flora Garden. Photo by Morrigan McCarthy.